Most businesses today own a website. And those that want to tap into Social traffic, also have Business Pages on social sites. Facebook offers them the ability to create a Business Facebook Page. But creating merely the page isn’t enough anymore. You’ll need to tell Facebook that this Business Page is the official representative of the website owned by the company. Before we go through the process of how to do that, let’s get familiar with the key term: Domain Verification first. 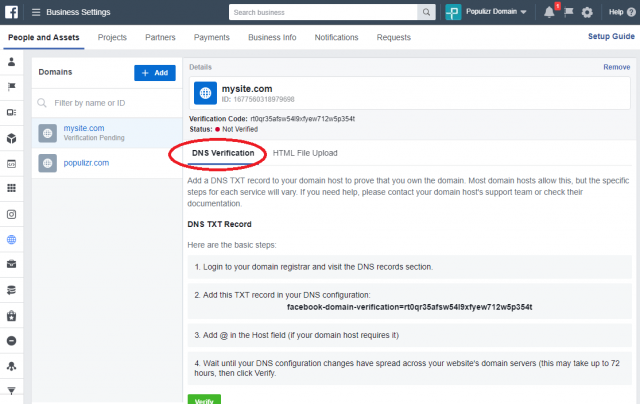 Similar to Google Console, where you have to prove to Google that you own the domain, Facebook introduced its own Domain Verification process. The reason is simple: to fight spreading fake news on the network, Facebook has to eliminate impersonating Pages. It helps users get the actual company updates. It also helps companies protect their name on Social Media. The added benefit is that when you send scheduled updates on your verified Facebook Page, you can tell Facebook how, and most importantly WHAT, to show when you share your latest blog post. But more on that later. Domain Verification is intended for anyone who has a website and posts on their Business Facebook Page. Every business with a website and a Facebook Page needs to connect the two on Facebook. We call this process Domain Verification. 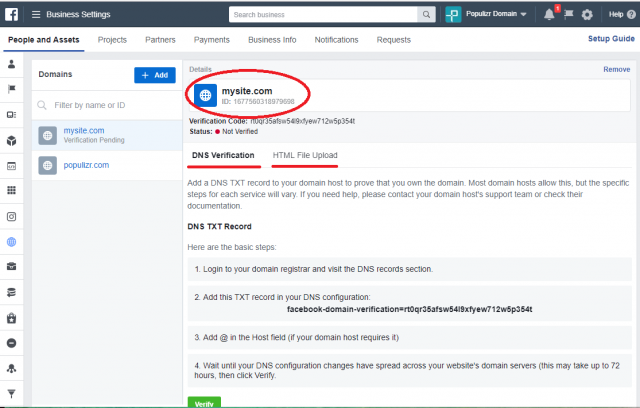 With the simple step of verifying your domain, you show Facebook that you are serious about Social Marketing, and you help Facebook protect your brand name from impersonating Pages. Once Facebook knows which ONE page is linked to the corporate website, it treats all other impersonating pages as imposters. This should help your Reach. 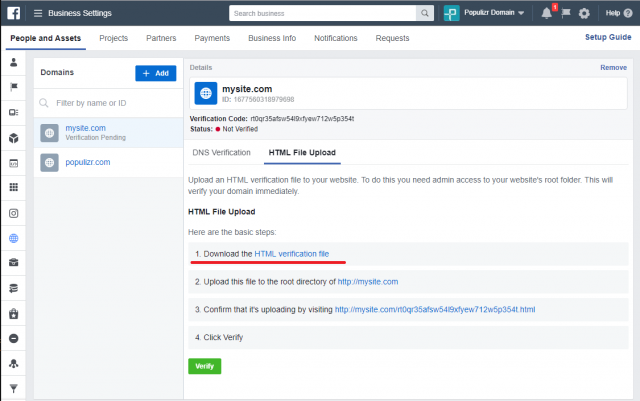 As we mentioned already, owners of pages who verify their domains can tell Facebook how to display any shared links from your website. By default, Facebook will take the blog post’s Title, Featured Image and Meta Description. But, when you have a verified domain linked to your Facebook Page, you can tell Facebook to post the link and share any image, title, and text excerpt you choose. Domain Verification is a simple process. 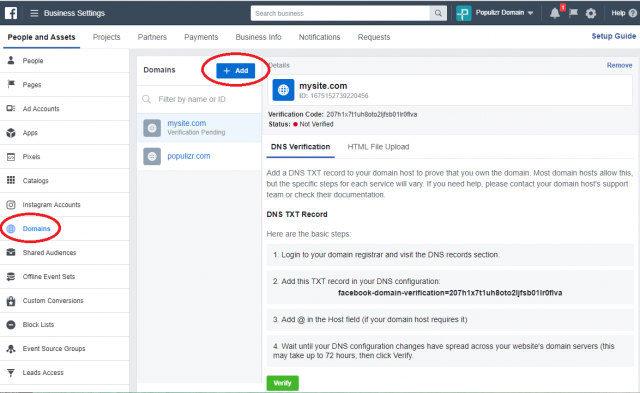 You’ll need to add a domain, assign the domain to a specific person to manage it, and then, link that domain to your Facebook Page. 1. 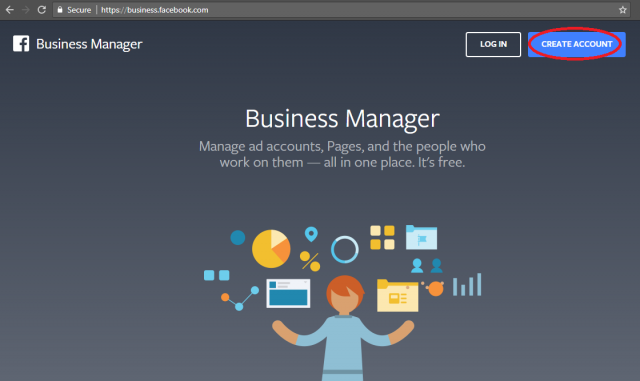 Go to business.facebook.com and create a Facebook Business Manager account. 4. Type in your Domain Name (e.g., mysite.com). After doing this, the domain will be added to your Assets. Then, two basic steps follow. The first step is to prove ownership of the domain, which is similar to how we do verification for Google Console. 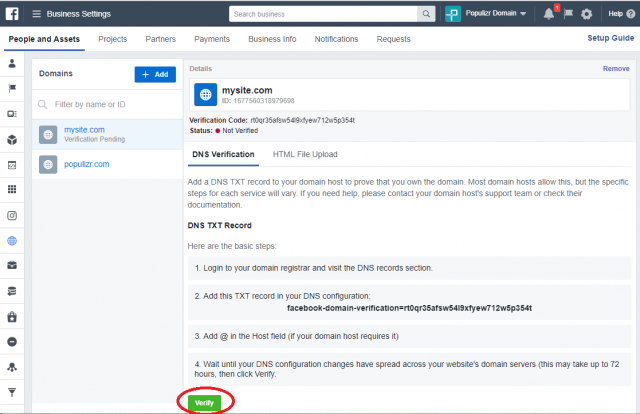 First way for domain verification is with DNS TXT Record. This is a domain-registrar level of verification. 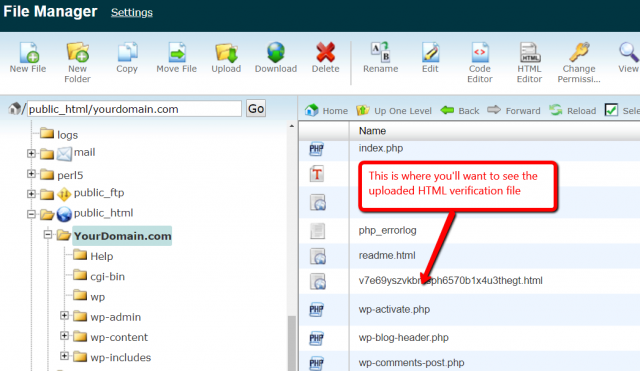 It’s a good option because you verify the website using your domain registrar, without altering/touching the file system of your website. It’s also the geekier way of doing stuff. Most of the time, DNS edits take place almost immediately but be prepared to wait up to 72 hours. This will usually be the preferred way of verification as it’s much simpler to do. Basically, you download a verification file from Facebook and upload it to your website’s root directory. And that’s it. 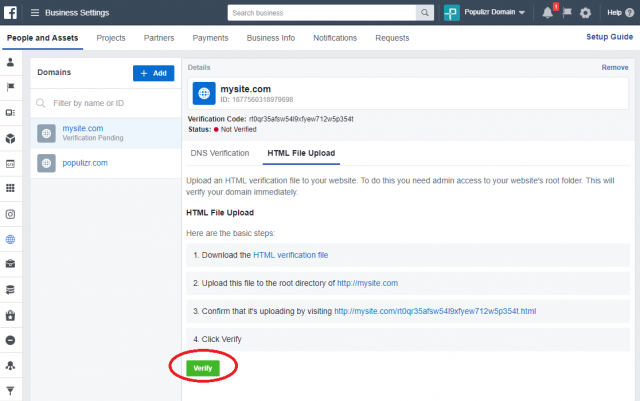 You’ve verified your website/domain with Facebook. 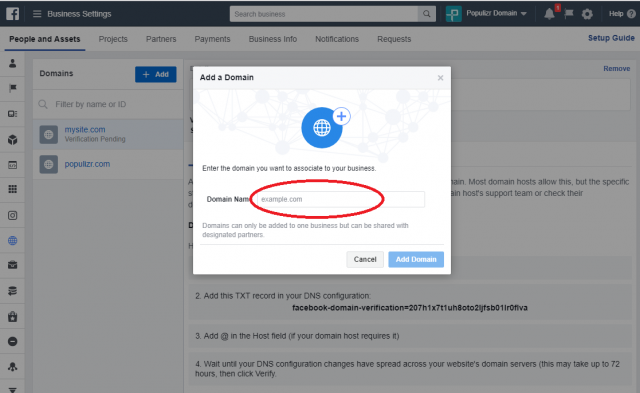 When you verify your domain, the next thing to do is assigning your Business Facebook Page to the verified domain. This helps Facebook know that whatever you post on the Business Page, is an official update of the brand behind the verified website. And that’s it. 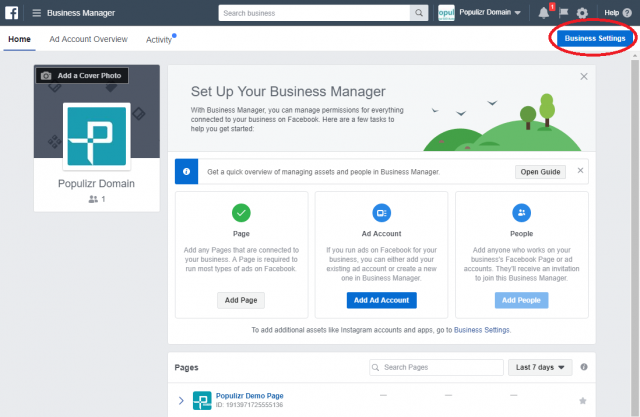 Your Facebook Business Page is assigned to your domain. Now Facebook knows that everything you post on this Page is the official social update of the company behind the verified website. 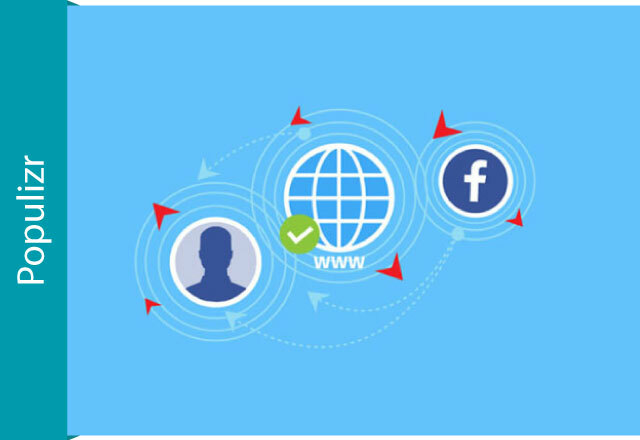 Verifying your domain and linking it to your Facebook Page is a crucial step in securing your brand presence on Facebook. By doing so, you claim ownership of your site, and you tell Facebook which Business Page is the official representative of your brand, on Facebook. Facebook made this process very simple. 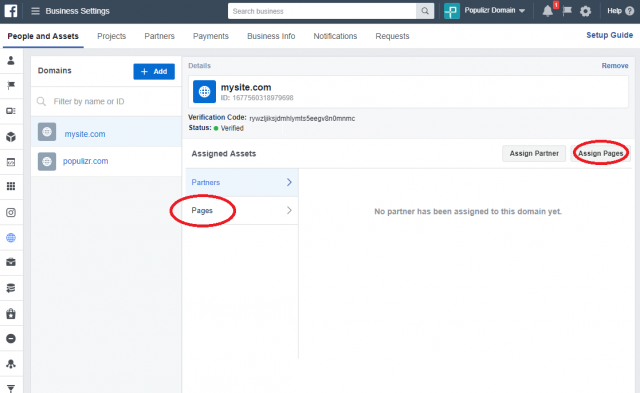 Even non-techie Page owners can do this, in just a few minutes. 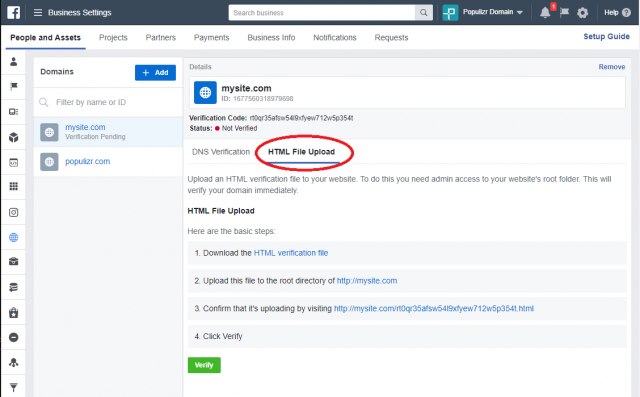 Now that you know how it is done go ahead and verify your corporate website and connect it to your Facebook Page. This will help you share your blog posts and updates multiple times, without creating duplicate content.